Recently we’ve been covering how to use a Blu-ray disc in your PC. Here we’ll take a look at backing up large amounts of data to a single layer Blu-ray disc. 1. More and more you’ll see PCs coming with Blu-ray disc drives. The cool thing is it’s not just a technology for watching HD movies, but you can backup large amounts of data to them. A single Blu-ray disc holds 25 GB of data and a dual-layer will hold 50 GB. Using an optical disc to backup your data may seem archaic, but because they can hold so much data, you might find it faster for getting data to friends or colleagues easily. Here we’ll take a look at how to burn a lot of data to Blu-ray in Windows 7. 2. Organize all of the data you want to burn to Blu-ray and pop a blank BD into your drive. For this example we have a folder with some Linux and Windows ISO images in a folder which is 6.8 GB in size. 3. If you have AutoPlay enabled a window will pop up asking what you want to do. Click on Burn files to disc. Here you can see we also have ImgBurn installed, but you might not have that installed, so we’ll use Windows. 4. If AutoPlay doesn’t come up, you can simply open Computer and drag your file(s) to the BD drive. Alternately, you should be able to right-click the file and click Send To and select your Blu-ray drive from the Context Menu. 6. 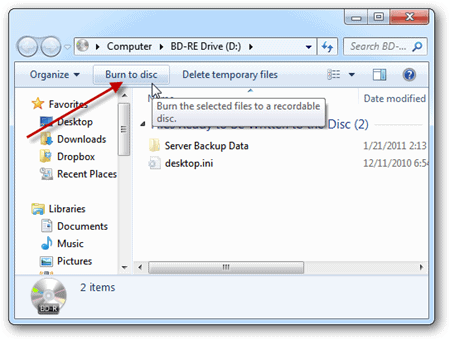 Give your disc a title and select to use it like a USB flash drive or with a CD/DVD player. For this example we’ve selected CD/DVD because the disc we’re using isn’t rewritable. 7. A balloon notification will pop up letting you know there are files waiting to be burned to disc. Just click on it to see the files and begin the burning process. 8. Now click on Burn to disc. 9. Here you can change the Disc title, select the Recording speed…generally slower speeds are better to ensure data integrity, but you can select a speed that your blank BD and drive will handle. 10. Now just wait for the burning process to complete. 11. After the disc has finished burning, your tray will eject and you’ll have the files backed up and accessible by those with a Blu-ray drive. If you have a lot of data that won’t fit on a standard DVD, will take to long to transfer over a network, or you don’t have a flash or external drive with enough space, a Blu-ray will do the job. Its still an interesting question /story, even though since 2011 USB sticks have now grown to enable a lot of data to be transfered. I had to research this recently end of 2018. Blu Ray can still be useful! I had 3 old hard disk drives well over 6 years old and heavily used, 1 used as a master in an old computer and two working as manual copies, until I discovered an app to syc the drives. Fearing drive failure, I looked into either burning all my Photos And Video from the last 15 years to Blu Ray, or putting onto another set of hard disk drives. I had 650GB and some 33,000 + files which would fill circa 28 Blu Ray disks or 3 number 256GB USB sticks. Either way I would require an additional 2 copies incase a virus shreds my important memories. I decided my options could be 1 new HDD with 56 Blu Ray Burns or 6 number USB sticks at 256GB each or….. The choice I made in 2018 compared to what I would have made and did myself circa 2011 is that Now I would need three number hard drives which are probably cheaper and more reliable, take up less time burning data to DVD or Blu Ray. I am able to put the HDD in as one internal drive and two Full Size external drives in USB cases. Not all HDD are connected all of the time to reduce the chance of a virus destroying all data. AND the full size HDD’s mounted in externasl USB cases are portable from Tower PC to any machine that has a USB connection. The above only covers Photos and Video backup, obviously over the years, I have equal amounts of MP3 + MS office files OTHERS etc etc, so I think the multiple HDD solution is probably better in 2018 as with 3TB to 4TB HDD being common in 2018, you can store a lot!